The Miami Heat clinched their second NBA title by routing Oklahoma City 121-106 thanks to a balanced attack and 26 points, 13 assists and 11 rebounds from superstar LeBron James. 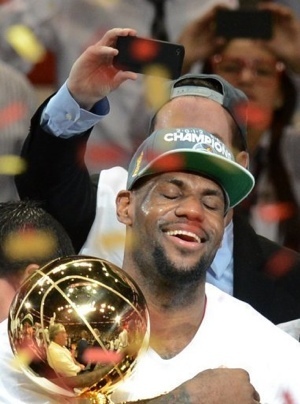 James on Thursday was named the Most Valuable Player of the NBA Finals after leading the Heat to the crown, capturing his long-sought first championship and delivering on the promise he made to Heat fans when he came to Miami two years ago. “I am happy I was able to make enough plays to put ourselves in a position to win this championship,” said James immediately after the game. Mike Miller came off the bench to sink seven-of-eight shots from three-point range and finish with 23 points while Chris Bosh added 24 points for the Heat, who won the final series 4-1 to claim their first title since 2006. “I got a lot more gray hairs but this one is so gratifying,” said Miami coach Erik Spoelstra. “We knew we had the confidence in what we could do but it would be a long season and it would be a tough road. “We kept saying all year long it would be the toughest thing we’d have to do in our professional lives to get back to here and finally get those four wins,” the coach added. This was James’s third trip to the NBA Finals, including one with the Cleveland Cavaliers, but his first title in his nine years in the NBA.